A few weeks back, Roadtrip-'62 ™ looked at things that were manufactured along US-4, but today, let’s discover things that are good to eat along US-8. While US-8, is not in New England, it is another short route. This highway runs just 280 miles, mostly within Wisconsin. The western end was once extended south to Minneapolis, Minnesota before 1962, so we could have traveled there. But it was truncated in 1981 back to Forest Lake, where it also originally ended. Today it again runs from Norway, Michigan to Forest Lake, Minnesota, spending just over 2 miles in Michigan and 22 in Minnesota. Highway US-8 is short enough to drive in one day, so I figure to have breakfast here in Norway before we head west, lunch somewhere near the middle, and dinner near the end of the road. Mike's On Main is a long-time family restaurant in Norway, that may have been here for over 50 years, though previously known as The Rialto. Though the exterior looks kind of cobbled together with poor 1970s or 1980s style pieces, the art deco decor interior is supposed to be authentic and well-preserved. Mike’s also has a small bowling alley, but that doesn’t figure into breakfast. Because I love corned beef hash and theirs is scratch made, that definitely figures into my breakfast plans. After I fill up myself, it’s time to fill up the car. In 1962, there was a small, 1930s-style Marathon station on the SW corner of where US-8 begins at US-2. It has been demolished and reconstructed as a large, modern Citgo station with a convenience store. I’ll fill up before leaving town because that’s about as close as we can usually get to finding a gas station left from 1962: at least it’s on the same property! Just at the Wisconsin border as we leave town is Piers Gorge, a scenic gorge carved out by the Menominee River. The name comes from the strangest use of the word “piers” that I’ve seen: the rock ledges that the river cascades over. There are four sets of rapids over the piers and the highest, at 8 feet, is considered an actual waterfall, named Mishicot Falls. There is a parking lot and dirt pathway on the Michigan side, giving an easy way to see the rapids as you walk upstream. The first cataract is only a few minutes up, with two others following closely, but the final is a mile beyond the third falls. The first pier produces white water rapids, the second is Mishicot Falls, and the third cataract produces a long section of white water between it and Mishicot Falls. At the third pier, you also get a magnificent view of a wild roaring waterfall in the distance. That is Sand Portage Falls, the final pier, where the river flows around two large chunks of rock, creating two islands. Besides the falls, on busy tourist days such as Saturdays, you can watch rafters riding the white water through Piers Gorge, including launching over Misicot Falls! Rhinelander, Wisconsin is the Home of the Hodag, a mysterious “creature” first mentioned by timberman, land developer, and prankster Eugene Shepard in 1893. It soon became the centerpiece of the 1896 Oneida County Fair and has lived in local legend ever since. The Hodag has become more fanciful ever since and is now said to be seven feet long and covered in green fur, to have formed nearby Boom Lake when it did a cannonball dive into a puddle, to prefer a fish fry and potato pancakes to eating raw fish, and smell exactly like a pine-scented car air freshener! Reminds me of the jackalopes supposedly found out on the South Dakota prairie. You’ll see a statue of a hodag in front of the visitors’ center. But enough foolishness, lets stop at a museum. Rhinelander began as a lumbering town in the 1870s and continuing its reliance on the forests, it currently has a paper mill. 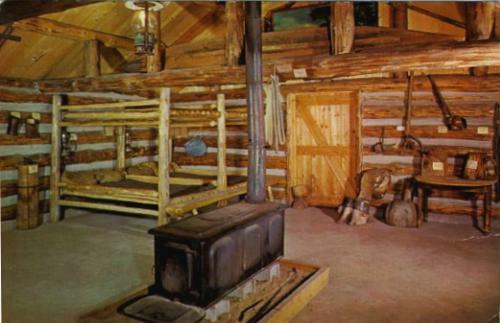 Pioneer Park Historical Complex is a reproduction of an 1870s logging camp. The site was established in 1932 by the local Rhinelander Logging Museum Association and the logging camp replica building was constructed in 1954, so we could have seen it on our 1962 roadtrip. There are several buildings including loggers' living quarters, a cook's shack, and a blacksmith’s shop with lumberjack tools and more. A couple of other museum buildings on the site are a replica Civilian Conservation Corps 1930s-style camp building and the Rhinelander Schoolhouse Museum. At the 1892 Soo Line Depot, parked rail equipment includes a 1913 Soo Line caboose and the 1925 Baldwin 5 Spot train, a narrow gauge locomotive that was operated here for logging until 1941, when it was sold to someone in Mexico. It returned to the museum in a 1973 three-way trade. After seeing the museum, let’s have lunch in Rhinelander. There is a choice of older restaurants to consider. The White Stag Inn has been here for decades and is a classic northwoods Wisconsin supper club serving basic meat, potatoes, and salads. The Rhinelander Cafe & Pub has been here since 1911, serving breakfast, lunch and dinner. Their lunch menu has a wide variety of sandwiches and salads. But the place that got my attention was Joe’s Pasty. Joe’s has been here since 1946 and I love pasties! These people have the entire process of making pasties well in hand. They render their own lard for the pastry crust and hand blend their own spices. If you don’t want the traditional pastry crust, they have also created a vegetarian whole wheat crust made with olive oil. Of course, they make the traditional pasty with beef and rutebaga, but they are not afraid to try new things. This is the first place I ever heard of with a sausage pizza pasty, a corned beef pasty, and a bison pasty on the menu! The hard part will be which to choose. St. Croix River near Taylors Falls, Minnesota and St. Croix Falls, Wisconsin (Photo by Appraiser at Wikimedia Commons, licensed under the Creative Commons Attribution-Share Alike 3.0 Unported license. After lunch we drive across the western half of Wisconsin to the St. Croix River, a tributary of the Mississippi River. That will take us a few hours at our less-than-freeway speed, and some of the float trips can take two hours, so let’s stop for ice cream before we go. It looks like our choices in St. Croix are Valley Sweets, a candy and ice cream shop, or Schoony's Malt Shop, across the bridge in Taylors Falls, Minnesota. Valley Sweets features lots of candies, including fudge. Schoony’s has pizza, brats, and other foods. Highway US-8 crosses the river at the north end of the St. Croix Dalles, an area where the river has cut a deep canyon through a stretch of basalt rock. The channel was mostly cut when glacial Lake Duluth emptied south after the last Ice Age, leaving a deep gorge. The St. Croix River is also deep beyond the visible gorge, often running 70 feet deeper under water. The bridge of US-8 was built in 1955, so we cross the same one today as we would have in 1962. The area both north and south of US-8 is within the Saint Croix National Scenic Riverway. The river is one of the original eight National Wild and Scenic Rivers established in 1968. It would be too new for our 1962 roadtrip except for the fact that the river has been here for thousands of years. It was added to the national list because the St. Croix is one of the last undisturbed, large rivers in the upper Mississippi River System. It’s a favorite for canoeing, kayaking and inner tube float trips, and I once tubed part of the St. Croix further south near Stillwater, Minnesota, but there are outfitters here. Back in 1962, you may have needed to bring your own canoe. This river has a gentle, relaxing current, so I enjoyed the wild country views from the river. And, I didn’t need to deal with whitewater rapids like the folks we saw this morning on the Menominee River! After our float trip, it’s off to the old end of US-8 in Minneapolis, Minnesota, and dinner. I found two places that seem worth at try: Matt’s Bar & Grill and Kramarczuk's East European Deli. Matt’s is not much to look at on the outside, just a typical corner bar with a Budweiser sign and fake stonework. But inside, Matt’s may be responsible for creating the local hamburger favorite, the Jucy Lucy. The bar has been here since 1954 and is now a Minneapolis landmark. They maintain that shortly after they opened, the “Jucy Lucy” was created when a customer asked for two hamburger patties with a slice of cheese in the middle. When the customer bit in, he exclaimed, “that’s one juicy Lucy. Today, it’s served with the cheese literally encased inside a hamburger patty. Matt’s says that if you see the “Jucy Lucy” spelled correctly, with an “I” in juicy, you just might be eating a ripoff. Over at Kramarczuk's, they have been cooking up Eastern European foods since 1954. The original owners came from Ukraine and brought their recipes with them in the late 1940s. Even today, every sausage, loaf of bread, every cabbage or spinach roll, and every piroshky is still made by hand from scratch for authentic flavor. Both restaurants have been featured on TV, with Matt’s on Food Wars and Man vs. Food, and Kramarczuk’s on Food Paradise and Diners, Drive-ins and Dives. After dinner, what can we do in evening? First, we’ll stop at one more natural feature, Minnehaha Falls in Minnehaha Regional Park. 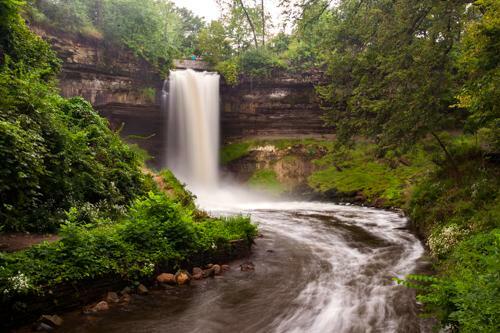 This is one of Minneapolis' oldest and most popular parks, probably due to the 53-foot waterfall on Minnehaha Creek and the limestone bluffs and creek overlooks of the falls. The park was designed by landscape architect Horace W.S. Cleveland in 1883 as part of the local Grand Rounds Scenic Byway system. There are trails throughout the park, including down into the gorge. It is the falls that Henry Wadsworth Longfellow wrote of in his “Song of Hiawatha” in 1853. I came here years ago but won’t subject you to my poor photography. We could also go to a drive-in movie…maybe. In 1962 there was at least one open drive-in in the Minneapolis area, the Bloomington Drive-In on the south side of town, near the current I-494 freeway, but it’s long closed. The closest thing I can find today is the Vali-Hi Drive-in, which has only been around since 1966. 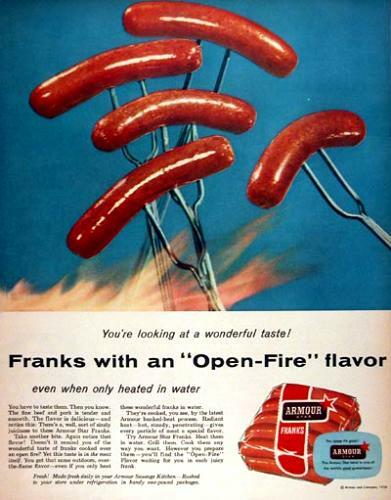 But their 1950s-themed concessions area brings back the memories of 1962, and they serve real Armour Star hot dogs every night for just $1. Almost an old time price! I’ll give it a try and see you next time on Roadtrip-'62 ™. Old Dutch Dill Pickle Chips are my favorite when I’m traveling the Northwoods! Dickinson County Fair, Norway, Michigan - Saturday, June 4, 2016. 108th fair with all the usual fun: games, carnival rides, livestock building filled with animals and auction, and tractor pull. Also a demolition derby on a one-third mile oval track that’s been here since 1942.